_Lucky Ten's 2012 Winter Workshop is February 20-24 from 9am to 5pm every day for children ages 6 years old and older. If you will not be away on vacation during winter break, please consider our workshop as a great place to leave your kids for the day. 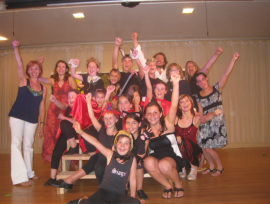 We'll have a lot of activities: vocal group class, hip-hop, tap, acting, ping-pong, painting classes, vocal and stage presentation one-on-one classes with each child. At the end of the week (Friday, February 24th) we'll have a show for parents and relatives with group songs performed by the students. Each child will also perform a solo song which was learned and staged during the week. to reserve a spot for your child by February 1, 2012.